I have gone back a forth between meal planning and just winging it. It took a long time for me to make meal planning work for me. Initially, I had a tendency to plan meals that ended up costing a lot of money to prepare. I have since read blogs, listened to speakers and written down my own thoughts and ideas on the subject. I firmly believe that meal planning, when done correctly can save time, money and energy. As with any tips/tricks list, you have to take what you can apply to your life and use it and then leave the rest behind. 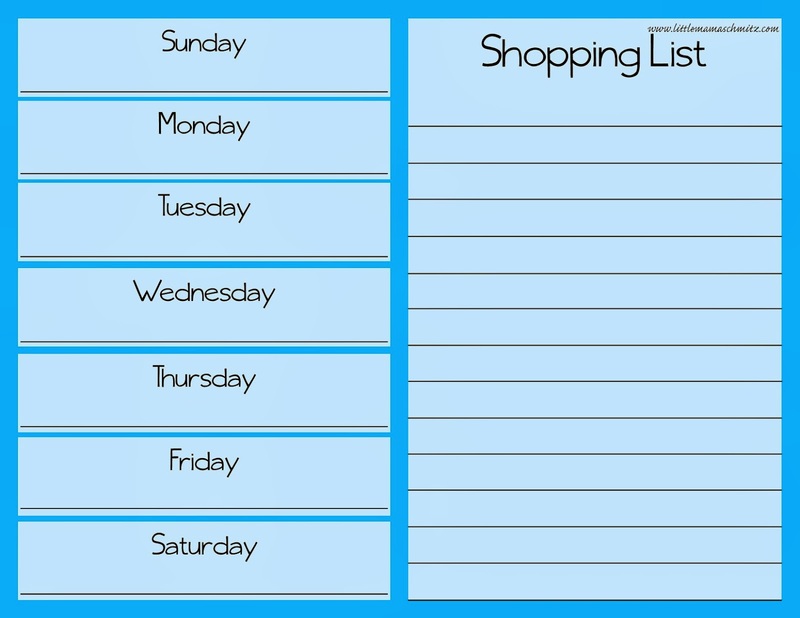 I choose to plan my meals and shop weekly because of my busy schedule. Things often pop up in my schedule with short notice, so only planning a week out helps reduce the number of changes I have to make. I always keep quick, go-to meals on hand for nights when something comes up and I have to stray from my scheduled meal. The first thing I do when planning my meals is to go through the calendar and take note of nights when we have activities that will affect how much time I have to prepare dinner. For example, on Wednesday nights we have 2 activities that run from 5:10 until 8:00. On these nights I prepare a very quick meal like sandwiches, frozen pizzas or quesadillas. Also, I include one "eat out" night per week on Fridays because we are not home. The next thing I do is take stock of what I have on hand. I check my freezer, fridge and pantry to see what type of ingredients I already have and think of what types of meals I can make with those items. I may even have a meal in the freezer from a previous night's leftovers. Then I check grocery ads to see what types of things are on sale. Next, I fill in the schedule making sure to account for leftovers. I also try to balance it so that I am not filling my schedule with lots of complicated meals. It's also fun to make one night a week "new recipe night". Here is a great way to actually make all of those recipes you pin on Pinterest. The next thing I do is to write down a list of everything that I need to buy for the meals. This becomes my shopping list, and I just add anything else that I need to buy as I notice it. So, that's my "process", now I will throw some tips at you! Make a list of your family's favorite meals. Think of EVERYTHING that you make for dinner, even if it's frozen pizza. Add to the list as you think of more dishes or as you try new recipes. Then you can pull from this master list when you are filling in your schedule. Make sure to have quick meals on hand in case something comes up. I keep things like frozen pizza or pizza kits, tortilla shells, spaghetti sauce and noodles, chicken nuggets ... I'm sure there are more that I'm not thinking of right now, but you get the idea. Life happens, and you can't always stick to the original plan. Having quick items on hand will help you be flexible when this happens. Use leftovers! My family does not particularly care to have the same meal two nights in a row, so I freeze my leftovers for future meals. Our Foodsaver is one of the best things I have ever asked for! Keep your "calender"! After a few months or so, you have a ready made plan that you can edit slightly to account for schedule changes. The work is done and you do not have to think about it anymore. Ask your family to help you create the master list. Let them help you plan the meals if they are interested. Give yourself a break! Make sure to have a few nights of easy meals. I found these great pizza kits at Aldi. The pack includes crusts and sauce to make two pizzas and is a great price. This is very quick and easy to make, and my kids can help! You may choose to create themes. That sounds strange, but I don't know how else to describe it. A lot of my friends do things like "Taco Tuesday" or "Meatless Monday" etc. This can make things fun and take a little pressure off of you when trying to fill in your schedule. My themed days are "Pizza Wednesday" and "Eat Out Friday." I automatically have two days filled. I feel like I can not stress enough to check what you have on hand before you start planning. I can not even tell you how many items I have that I stocked up on when they were on sale or that I bought thinking, "I can make this one night." Then those items get pushed to the back and forgotten. You may still need to buy a couple of items to fill in. Sometimes I get a bit lazy with this step, and boy do I notice it on my grocery receipt. Print out this FREE menu, and place it in an 8x10 frame. 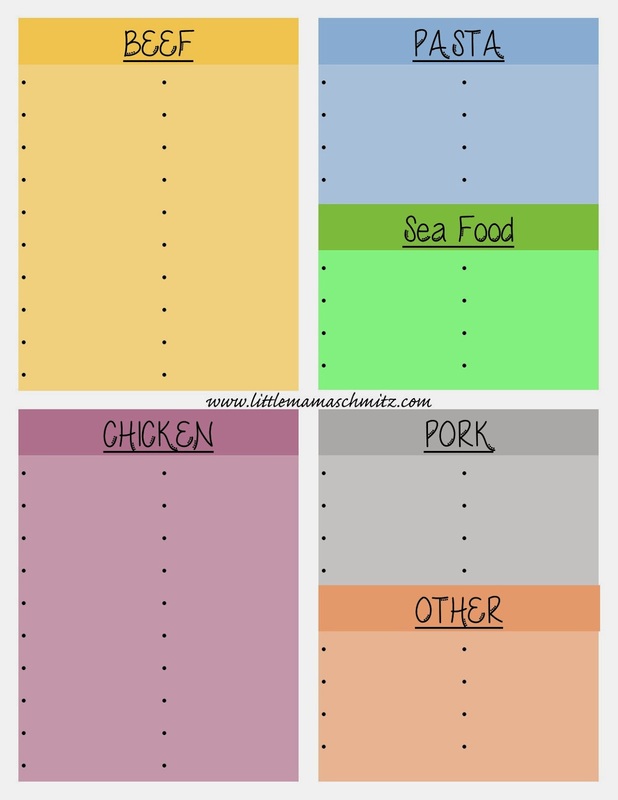 Place it in your kitchen and use a dry erase marker to fill in your menu each week. 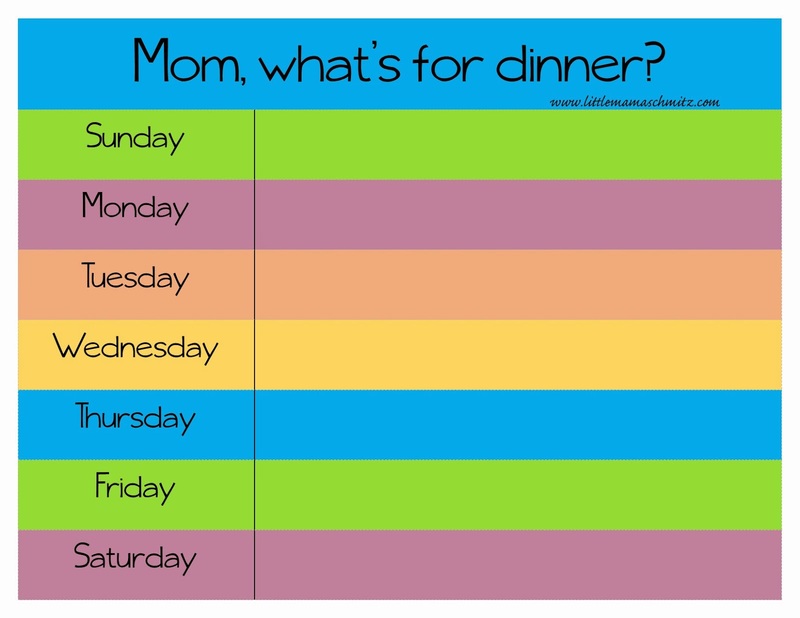 Use the worksheet below as an aid to plan out your weekly meals. Print it out and place it in a plastic sleeve. Use a dry erase marker to fill it in. You could also print multiple copies if you prefer. Use the worksheet below to create your master meal list.